Sickness behavior refers to the coordinated set of behavioral changes that develop in sick individuals during the course of an infection. A sick individual typically displays depressed locomotor activity and little or no interest in his physical and social environment. Body care activities are usually absent and ingestive behavior is profoundly depressed despite the increased metabolism that is necessary for the fever response. 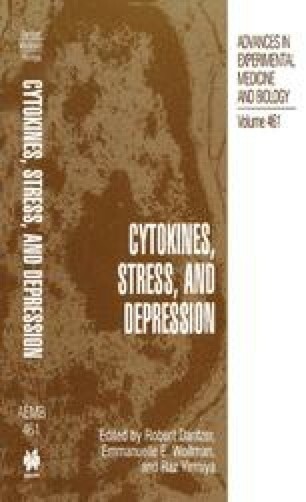 Since the initial demonstration in the late eighties that similar symptoms are induced in healthy subjects by peripheral and central injection of the proinflammatory cytokines that are released by activated monocytes and macrophages during the host response to infection, the mechanisms of cytokine-induced sickness behaviour have been the subject of intense research, carried out at several levels of investigation. The purpose of the present chapter is to review the results that have been obtained in this field during the last decade. At the behavioural level, there is now clear evidence showing that sickness behaviour is not the result of weakness and physical debilitation affecting the sick individual, but the expression of a central motivational state that reorganizes the organism’s priorities to cope with pathogenic microorganisms. At the organ level, this motivational aspect of sickness behavior is important since it implies that the endogenous signals of sickness are likely to act on the brain to activate a set of neural structures that are at the origin of the subjective, behavioural and physiological components of sickness. The presence of cytokine receptors in the brain is in accordance with this view.